Storefront for Art and Architecture asks: What are the architecture books yet to be written? - Archpaper.com Storefront for Art and Architecture asks: What are the architecture books yet to be written? Storefront for Art and Architecture asks: What are the books yet to be written? Storefront for Art and Architecture's "Architecture Books Yet to be Written 1982-2017-2052" will open the New York Architecture Book Fair on September 23. 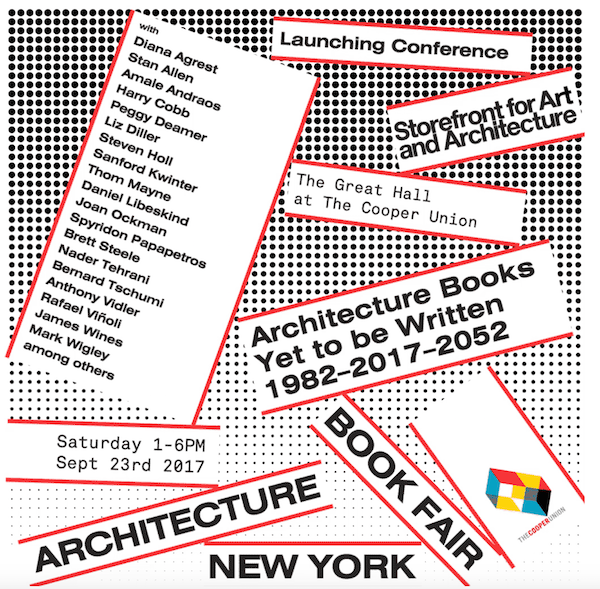 On Saturday, September 23, Storefront for Art and Architecture will launch the New York Architecture Book Fair with a day-long conference, Architecture Books / Yet to be Written / 1982-2017-2052. The event will ask architects to think about the past and future of architectural publication, enlisting critical voices in the field, including: Diana Agrest, Stan Allen, Amale Andraos, Harry Cobb, Beatriz Colomina, Reinier de Graaf, Peggy Deamer, Elizabeth Diller, Steven Holl, Sanford Kwinter, Daniel Libeskind, Thom Mayne, Enrique Norten, Toshiko Mori, Joan Ockman, Spyridon Papapetros, Brett Steele, Bernard Tschumi, Anthony Vidler, Rafael Viñoly, Mark Wigley, James Wines, and others. This conference is presented in partnership with The Irwin S. Chanin School of Architecture of The Cooper Union. Due to the waning number of architecture bookstores across New York, this Storefront event and attendant book fair intends to fill the gap for enthusiasts of architecture and urban speculation in print. At the conference, Storefront will also present BOOKS-NOW, a selection of signed architecture books published over the last year at a discounted rate. The New York Architecture Book Fair will open in June 2018 at Storefront’s gallery space as well as at bookstores and homes across New York. Time: Saturday, September 23 1:00 – 6:00 p.m.
RSVP here for the event.